This is my Personal Geocoin, it is a birthday gift to me! I product 250 silver and 50 gold Geocoins. I make available here however only 200 silver and 25 gold Geocoins. 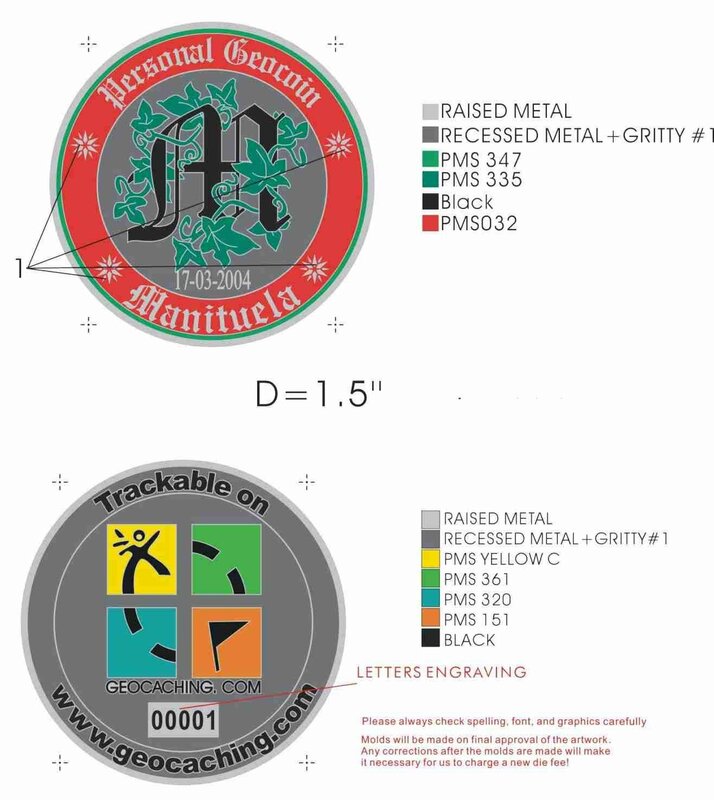 Only 2 silver and 1 gold Geocoin per person. Please log your pre-order and trade here! I'd lik two silver and one gold! Two silver and one gold please. I will purchase or trade you. I'd like to trade my chrome Mauison geocoin for one of your silver coins. Mahalo! 2 Silver and 1 Gold please. Put me down for one gold and one silver please. Put me down to purchase 1 gold and trade my personal coin for your silver. Thanks and happy bday! Geocaching Fun for the Whole Family! We'll trade one of our personal coins for one of yours. Silver is good for us. Email sent to request possible trade for 2.
one gold two silver please. I would love to trade our personal coin with you. One Silver and One Gold Please. please, 2 silver and 1 gold for me! I would like buy one of each please. Can I please order two silver and one gold. One gold and one silver. please. Do I wait and get an invoice form you? Great coin BTW. I would like 2 silver and 1 gold please! 2 Silver 1 Gold please. Put me down for 1 silver and 1 gold. I would like 1 gold and 1 silver please. Aaaaaaah....the next beautiful german coin is on the way! 2 Silver and 1 Gold please! german: Schaut wirklich super aus das gute Stück! bin nämlich momentan selber in der Coin-Planung und hätte da noch ein paar Fragen. One silver, one gold please. I was about to say two silver and one gold, but I guess I'm a bit late for that so two silver please. i would like one silver please. 1 silver, please! Shipping to NL. 2 silver please and Happy Birthday. Trade for one of each. I'd like to trade my personal coin for a silver of yours. Email me. 3 silver, please! Shipping to NL. 2 silver please. I wanted a gold one 2 but your sold out. Yes, Please pay with Paypal..
Two silver if still available, Thank you.